Two recently-arrived comix, "Grickle," by Graham Annable and "RPM Comics," by Rachel Masilamani, have several things in common. Both collect short works by each author, both are the artist's debut in the medium, and both are notable. At 120 pages, Graham Annable's "Grickle" (Alternative Press, $14.95) is the length of several individual comicbooks. An animator by day, Annable apparently spends his nights drawing comedic, metaphorical stories about capriciousness, cruelty and absurdity. In "The Sound of Paste," the shockwaves of a man's spilled toothpaste devastate a distant planet, revolutionizing its social order, while he goes to sleep with clean teeth. "Fishin' Trip" has two fisherman pals part ways when one enters into satorial oneness with the universe while the other catches an incredible amount of fish. "That Johnny's missing out," says the lucky angler. Annable draws characters in a drastically simplified, cartoony style with bug eyes and big noses, occasionally reducing arms and legs to sticks. But his animation experience reveals itself in the body language and movement of these black and white doodles. "Decency" has an obstinate frog taking blow after blow from a couple of rock-throwing jerks. Annable focuses on the frog for wincing effect each time a rock connects. But it's a Simpsons-like frog, laughably goofy-looking and stupid. The mix typifies the comedic irony of the whole book. 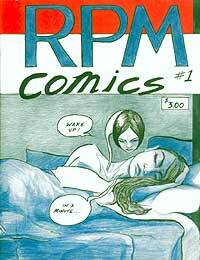 "RPM Comics," by Rachel Masilamani (24pp. $3.00) has a soft, colored-pencil cover that gives it a hand-made look. Which it is, in a way  she's self-publishing it. Inside the magazine-sized comic are black and white drawings of a skill that could only come from an art major. But while most art majors don't do comics well (the challenges of such a literary art form elude them) Masilamani seems to be a natural storyteller. The best of these stories all involve a woman's quiet moments alone or with others, revealing complex emotions with subtly and efficiency. Twice I found myself feeling like I had experienced another person's life. Twice! The black and white art, all done with super-fine pen lines, has plenty of nice detail. Masilamani does faces especially well, giving them an expressiveness and range that can't be reached with simplified characters. "Grickle," and "RPM Comics" are both examples of small press comix that don't get much support at comic shops. But Annable and Masilamani deserve attention and support as strong, independent new talents.